Hello friends. It is with a heavy heart that I come to you today; a heavy and horrified heart, I should say. But, before I tell you what has me so shocked, let me tell you how I found it out. Like me, you may need further proof of her involvement. I know, I didn’t want to believe it either, but it’s true! You can click that button up there, or you can click here to see her comic confession. No, it’ not optional. It’s an order. Back? Wasn’t that shocking? Didn’t that mysterious voodoo comic page send a shiver down your spine, especially at the mention of the Great Turtle Overlord? Aren’t you outraged? But, never fear! Though there may be traitors to humanity in our midst, remember that there’s always hope! Both Jonathan and I are working tirelessly to bring you updates in the story of the Terrible Turtles and their evil Conspiracy! In fact, you can check out a new comic page added every Friday right here on my blog. And if you’ve missed some past entries that’s okay because we have a handy dandy Table of Contents you can check out! Don’t forget! Entertainment, um, no, knowledge is our greatest weapon in the war against boredom – I mean, the turtles! 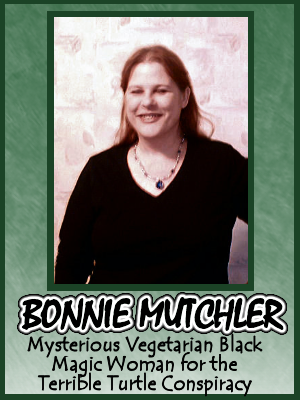 You can check out more of Bonnie’s poetry and meanderings on her MySpace blog.